R4 does redistribution of the 4.4.4.0/24 network as a Type-7 LSA with metric-type of 1. In this case the forwarding address will be an interface attached to R4. R1 and R2 which are Border routes will retain the forwarding address when translating Type-7 to Type-5 LSA. With this theory, let’s check the current packet flow towards the external network. Each interface in the topology has a cost of 1. Route calculation for R1: R3 which has a higher RID (33.33.33.33) than R1 (11.11.11.11) will do the Type-5 translation. R1 will get a Type-5 route and a Type-7 route each having a cost of 20. Then it calculates the cumulative cost to reach the forwarding address which will be 22 for both. Thus R1 will have an E1 route in its RIB. 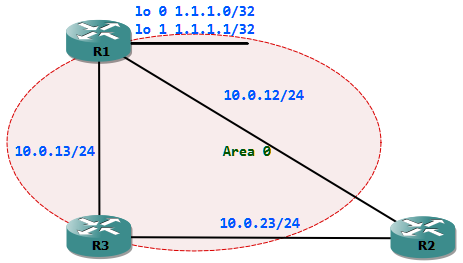 An external route could be injected into OSPF domain either as a Type-5 or Type-7. The Type-7 route will be injected by an ASBR from a NSSA area. The Type-5 route will be injected by an ASBR from any normal area. 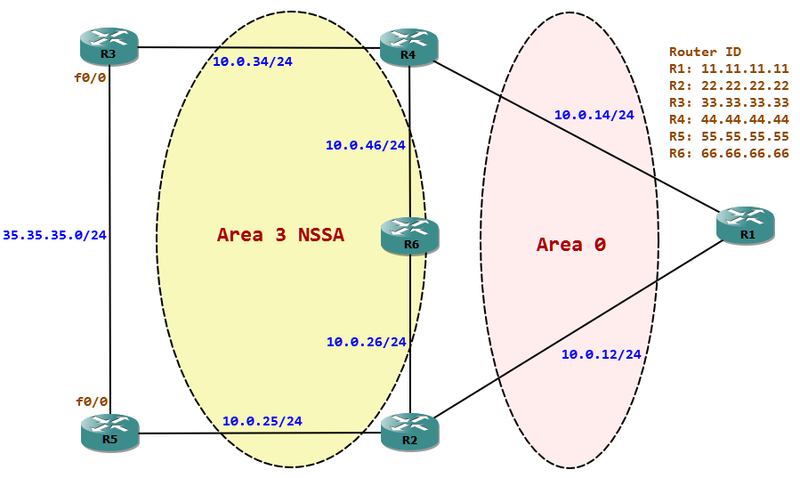 A Type-7 LSA will be translated to Type-5 by an NSSA ABR and flooded it to the whole OSPF domain. If there are multiple NSSA ABRs, the one with higher RID will do the translation. The forwarding address and the metric-type will remain the same as the Type-7 route. If the forwarding address is non-zero, then metric / cost to the forwarding address is accounted or else the metric / cost is to reach the advertising router (ASBR). If there are multiple external paths to an identical destination, the NSSA ABR will use the following rules for path selection. As all routers in an area must have the same copy of the database and each route builds its RIB by running SPF algorithm , Intra area routes can only be filtered locally on a router. Case 1: The loopback networks of R1 must be filtered from entering the RIB of R2. The 10.0.13.0/24 network must be reachable via R1 and R3.